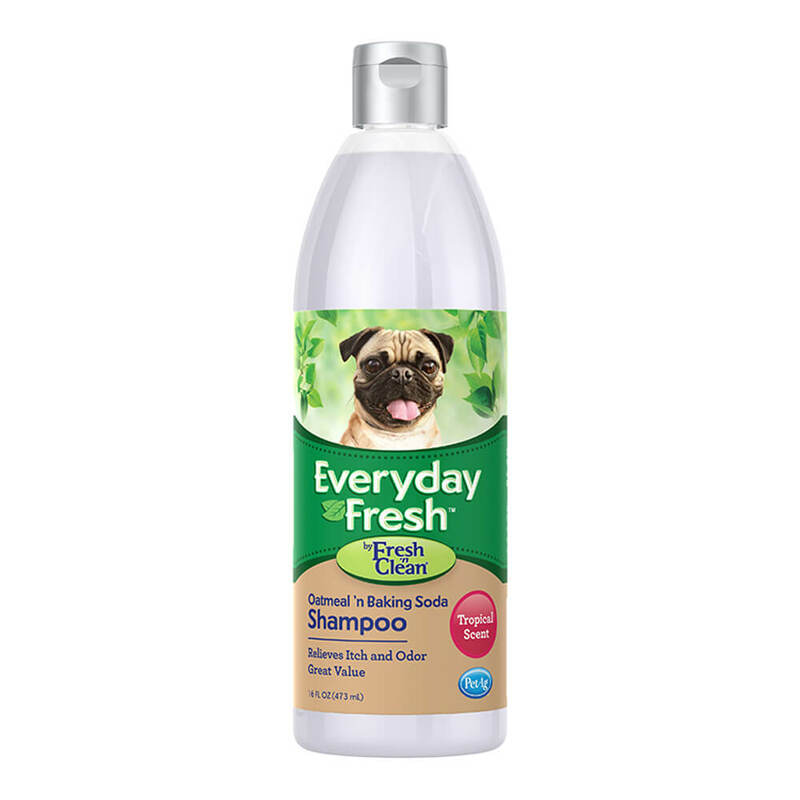 Recognized as the #1 groomer-preferred brand of grooming products, Fresh n Clean Everyday Fresh Oatmeal n Baking Soda Shampoo uses a trusted formula and an exclusive, long-lasting scent technology. A complete line of comprehensive grooming products delivers the finest grooming service for dogs and the happiest experience for their owners! Fresh n Clean Everyday Fresh Oatmeal n Baking Soda Shampoo combines strategic ingredients to promote hair and coat strength. A soothing blend of natural colloidal oatmeal, baking soda, aloe vera, pure water and gentle cleansing ingredients infused with protein penetrates the hair fiber and strengthens, repairs and protects your dog's coat. Fresh n Clean Everyday Fresh Oatmeal n Baking Soda Shampoo creates a rich, penetrating lather that washes away dirt and debris, leaving the coat and skin clean, refreshed and fragrant with a pleasant tropical scent. Besides providing long-lasting control odor with baking soda, it also adds aloe for soothing and replacing moisture in the skin and coat. Economically priced for every day use, it is soap-free, biodegradable and easy-to-rinse. Cleansing agents (Sodium Lauryl Sulfate, Decyl Polyglucose, Sodium Bicarbonate/Baking Soda) Conditioners (Di-Hydrogenated Tallow Phthalic Acid Amide, Cocamide DEA) Soothing Agents (Oat Flour, Sodium Bicarbonate/Baking Soda, Aloe Vera), Deodorizing Agent (Sodium Bicarbonate/Baking Soda) and Fragrance. Wet coat with warm water. Pour shampoo along pet's back. Work shampoo into coat. Add more if needed. Rinse. Shampoo again. Rinse until water is free of suds. Dilutes 7:1.